First of all, I hope you’ve all had a great Christmas. It’s been really nice spending the festive period with all the family, something we’ve not been able to do for a good while as my wife and I have been living in England for the last six years. 2012 is almost upon us and it kind of gives me an excuse for doing this post – one I’ve been wanting to write for ages! It’s about my favourite band, Kasabian. If you’ve never heard of them, where have you been for the last eight years?! They’re from Leicester and although the music press love to make comparisons with other bands who have quite obviously influenced them, Oasis, Primal Scream and The Stone Roses (incidentally three of my favourite bands), they’ve definitely got a sound all of their own. They’ll be playing a special gig at London’s O2 on Hogmanay which will be streamed live on You Tube. I’m not a big fan of New Year and always have a really quiet one due to normally having a game the next day. It’s usually just me and my wife seeing in the bells, watching the fireworks on the telly and maybe a bit of Jools Holland, depending on who’s on. But this year Kasabian will be bringing it in with a bang! My brother and I went to see them in Glasgow a few weeks ago and they were awesome. I’ve seen them live on a few occasions and every time they’ve been outstanding but this was probably the best they’ve been. The songs they played from the new album ‘Velociraptor!’ add a new dimension to an already impressive back catalogue. The set list had all the favourites and it says something when they have the audacity to bring out a huge hit like ‘Underdog’ only three songs in. ‘Switchblade Smiles’ was a highlight from the new record that was even better live, check out the official video below. The two main men, Tom Meighan and Sergio Pizzorno, were buzzing as usual but the whole band was on top form and looked like they were enjoying themselves as much as the crowd were. The atmosphere was mental! Having not been to a gig up here for ages, I’d forgotten how lively the Scottish fans can be. I recorded a fair bit of footage from the gig itself so here’s a little taste of what you can expect on New Years Eve. MOVE! Can you feel it coming? It’s time to get out the razor and shave off the mouser. The furry little friend above my top lip has been growing gradually thicker by the day and I think I’m going to miss it once it’s gone – my wife definitely won’t! In light of it’s departure, I think this is the perfect time to pay homage to some footballers who were fully committed to their moustaches. I’m not talking about players who went through a brief phase of having a little bit of hair adorning their upper lip in keeping with the fashion of the time or like myself, enjoying the novelty for a month. I’m championing those men who wore their moustache with pride. After writing my last post about Movember, it got me thinking about the lack of facial hair in football nowadays, particularly moustaches. In the 70’s, 80’s and even into the early 90’s nearly every team had at least one player with a tache and in my opinion it’s a loss to the modern game. Here’s a selection of hairy-lipped footballers that I remember growing up. These are my Top 5 Football Moustaches. What a player, what a tache! One of the most recognisable and successful moustaches of the era. Not only was he hard as nails but the sheer volume of his mouser was intimidating in itself. Ok, I know it’s probably not the first thing you notice (that’ll be the blond curly mullet!) 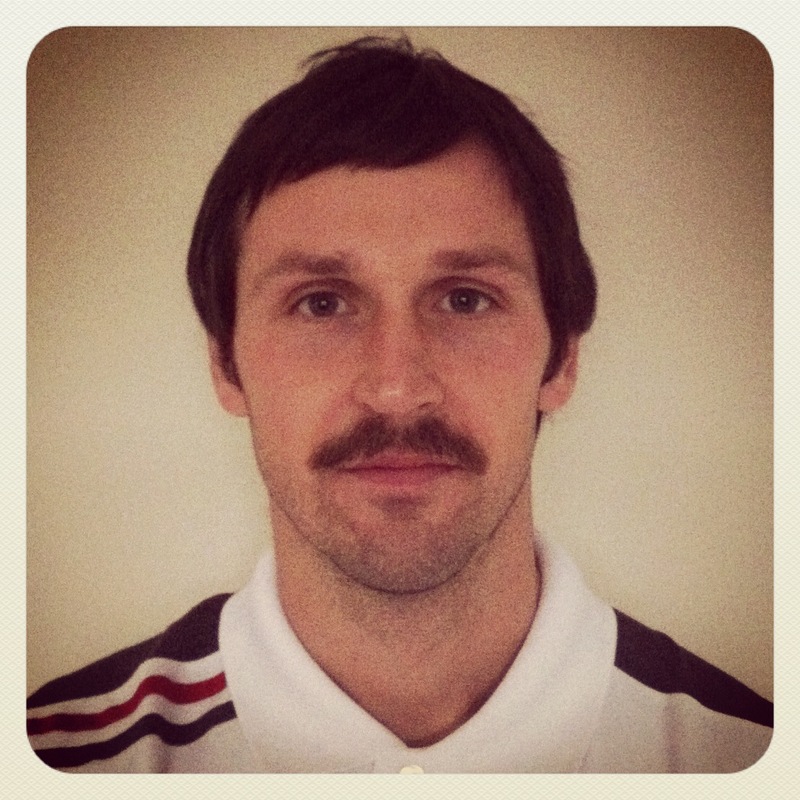 but Völler’s moustache deserves some attention. You’ve got to admire the man for having the audacity to persevere with this combination for so long. Ipswich legend Wark and his cowboyesque tache not only graced the International and European football stages but also featured on the silver screen. The big Scotsman appeared in the film Escape To Victory alongside Michael Caine, Pelé, Bobby Moore, Ossie Ardiles and Sylvester Stallone, adding some much needed facial hair to the otherwise fresh-faced Allies squad. I played in the same Dundee United side as Sieb for two and a half years so I’ve seen this one in the flesh. With his swarthy looks he puts you in mind of a huge mexican bandit and I couldn’t imagine the big Dutchman without a tache. He said he started growing it when he joined his brother’s gang ‘The Fast Eagles’ during his teenage years in Holland. Look out for more stories about the big man in a future ‘Teammates’ Post. They look like they could have been separated at birth, and should technically be two separate entries, but both of these goal machines favoured very similar styles of facial hair. The wearers of these simple yet effective moustaches terrorised defences during the 80’s and 90’s and now they both enjoy careers in the media. Rush has now disposed of his moustache, while Aldridge’s is still going strong. I know who I think looks best. Come on Ian, you know you miss it! Let me know what you think of this selection of moustachioed footballing heroes. Who would you put in your top 5? Here’s the final photo of my own effort. I’m quite happy with it even though it’s not really worthy of appearing on the same page as these legendary mousers.